Lynnity's motto is to 'Let the Farm be your Pharmacy'. They believe that plants are the best way to support good health, which is why the brand continues to push boundaries of innovation to produce uncompromisingly authentic, tasty and unique health products. The main driver of their products are that they contain phyto-nutrient ingredients. For your information, phyto-nutrietns are components of plants that are powerful defenders of health. Studies have shown that people who consume more plant-based foods have reduced risk of chronic diseases such as diabetes, heart disease and cancer. Phyto-nutrients help to get rid of toxins in the human body by stimulating enzymes, boosting the immune system, improve cardiovascular health and promote healthy estrogen metabolism to help the body function at optimum level. 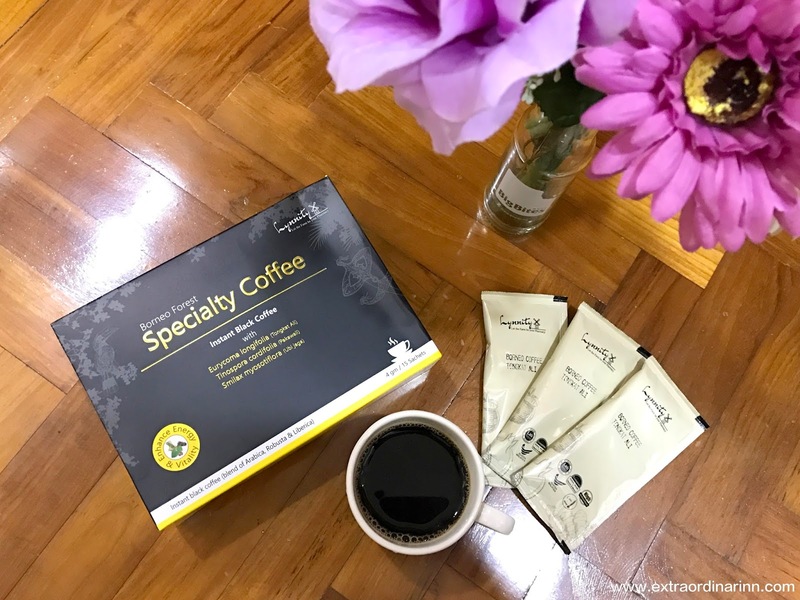 Similar to the previous coffee, this instant black coffee is homegrown and good for your health. 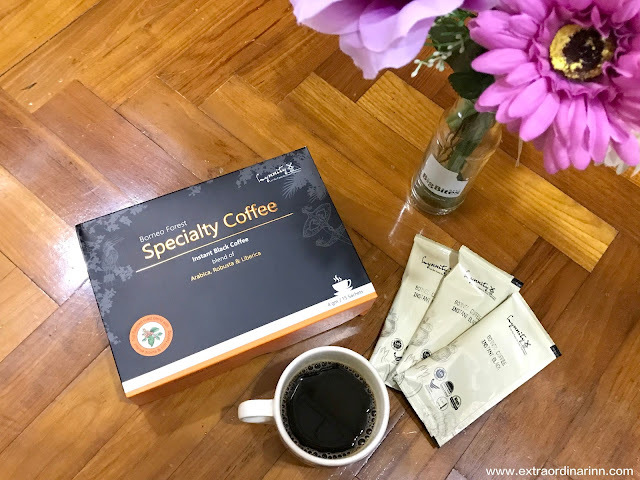 This specialty coffee starts with a careful selection of Liberica, Arabica and Robusta coffee beans that are found in the lower hilly parts of East Malaysia. While black coffee is preferable for good health, I would say adding sugar and milk really does enhance the taste. The lack of herbs in this coffee means that it leaves a sourish note as an aftertaste. I am constantly on the go and I've long discovered that if you can't eat, at least consume a supplement drink to help you stay fueled for at least a few hours. Meal replacement or health drinks are like instant meals on-the-go that gives you the boost of nutrients and energy that you need to not only stay energised, but keep your bones and skin healthy too when you have no time to take care of them. Vegetarians, rejoice! Botanic Health is said to be an effective and reliable choice for you! The natural stem cell and multi-mineral ingredients is clinically proven to improve bone and joint health (protect the cartilage, improve bone density and add mobility) which I personally think would suit the older crowd quite nicely, especially those who are suffering from osteoporosis or post-menopausal women. Botanic Health contains unique ingredients like mangosteen, blue green algae and orthosiphon to provide vitamins, minerals and amino acid complex that the body needs. Amongst the two health drinks received, I prefer the taste of this drink more as the citrus leaves a slightly sweeter aftertaste and is overall easier to drink. I find that unlike most health drinks, this one is much easier to stir and consume as it is not too thick. Oh yes, I would introduce my dad to this product as well as it also improves cardiovascular health and manages cholesterol to see results in 10 days! The Botanic Superfood range contains grains, beans, fruits and protein to give you a nutritional-complete superfood that encompasses food from all four key food groups. This helps you to absorb all the nutrients that you need to maintain a healthy and interesting diet easily. The benefits differ for various age groups and for adults like me, this product helps to increase energy and eye strength, as well as improve digestive functions and gut health. Some of the ingredients include chia seeds, mulberry and lingonberry. To be honest, this drink is quite tasteless but it is still bearable. I wonder if I am able to add milk or something to it to make it tastier? However, I do find that I get a boost of energy for the first 4 hours after consuming this drink in the morning. I rarely eat breakfast, so this drink is a good substitute to keep me going till lunch. My bro could definitely use this as he has to get up super early for school and this will be a good breakfast substitute for when he is in a rush. As cliche as it sounds, the best gift that you can give someone is the gift of health. Aside from looking like adorable wine bottles, I find that the Botanic Juice would be great as a gift to your friends and family. At first I was confused as to why the product was so viscous and how am I supposed to consume it. Later on, I found out that you are supposed to consume 1 - 2 cups (15ml each) after breakfast daily using the tiny cup provided. FYI, the tiny cup is just like the ones that doctors provide you to drink medicine :p The box of 5 is supposed to last you for 15 days whereby it helps with better weight management, cleansing or detox, increased metabolism and increased antioxidant levels to build your immune system. The juice is really thick and the colour and scent might turn some people off, but oddly, I love the taste. The pineapple, black ginger and gotu kola (a magical fruit extract) leaves a sour and tangy aftertaste. If you feel sleepy, the sourness will definitely give a kick and wake you up! This product would suit my mum who is always looking for remedies to reduce body fat haha. Another thing that I dislike is.. the strong smell of ointment. Haha. That is why when I have a headache, I tend to go to sleep instead of using essential oils to relief them. However, this product which has to be my favourite of the bunch, has totally changed my perspective! Lynnity Relief is a proprietary blend of roll-on essential oil helps to soothe minor discomforts including headaches and neck pain. If you look closely, you can see the flower in the tube and that is the main ingredient - Myosotis Sylvatica flower. I could only describe the scent as invigorating and soothing, and is not too choking when I apply it directly on my temples or neck. I think my sister would love this product too as she is always complaining about having headaches lol. 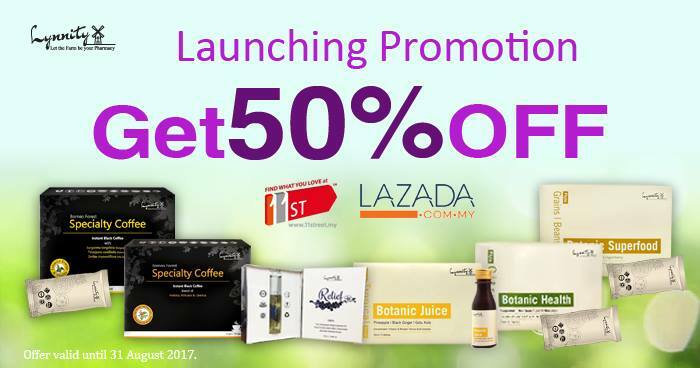 If you guys would like to purchase Lynnity products too, do check out the Launching Promotion on 11street and Lazada Malaysia! Up to 50% OFF storewide, you guys! Do take note that these awesome deals will only be for the month of August, so don't miss out! Ok guys, that's the end of my super long review! All in all, I just wanna remind everyone to not neglect their health even when life gets hectic, especially during this time of the year. Thanks to products like Lynnity's range that combines scientific research and nutritional expertise, now everyone can get healthy easily (this is kinda like a 'shortcut'). But of course, don't forget to consume REAL fruits and veggies daily to keep you going!